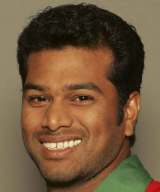 Alok Kapali was born January 1, 1984 in Sylhet. He is a Bangladeshi cricketer. He is an allrounder who bats in the middle to lower order and bowls leg spin with a run-up (walk up) similar to that of Shane Warne. He is the only Bangladeshi cricket player to take a Test hat-trick. He is talented but erratic legspinner and a batsman of undoubted potential, Alok Kapali has a burgeoning reputation as an allrounder, particularly in the one-day game. He made a promising Test debut against Sri Lanka in 2002, and impressed with his technique and temperament in an otherwise disappointing match. Batting as high as No. 6, in spite of a first-class average in the mid-teens, he made starts on both occasions without being able to go on, and has since demonstrated a bold attitude towards quick bowling. His bowling has improved, since disappearing for more than five an over on debut, and against Pakistan at Peshawar in August 2003, when still only 19, he became the first Bangladesh bowler to take a hat-trick in Test cricket, a performance that secured his side their maiden first-innings lead, at the 23rd attempt. Find Alok Kapali profile and stats of batting, bowling and fielding including latest updated news of Alok Kapali, videos and images at Hamariweb.com. Also find detail Player profile and career statistics of Alok Kapali of Bangladesh. Alok Kapali - Find Alok Kapali of Bangladesh Cricket Team complete player profile, number of matches, runs score, wickets & catches, Statistics, Records, Alok Kapali Latest News, Alok Kapali Videos, Alok Kapali Photos, and other Alok Kapali Cricket Team players.